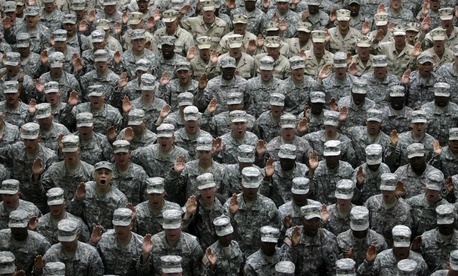 The House on Friday approved a 1.8 percent pay boost for military service members next year. The final vote tally was 340 to 73. The pay provision is part of the massive fiscal 2015 Defense spending bill, which includes a total of $128.1 billion for military pay and personnel. “This funding level is $669 million below the fiscal year 2014 enacted level, but is sufficient to meet all needs due to reductions in force structure and large unexpended balances,” stated a press release from the Appropriations Committee summarizing the bill. The 1.8 percent pay increase is in line with the House-passed Defense authorization bill. It is more than President Obama’s proposed 1 percent pay raise for military personnel in 2015, and the 1 percent boost currently in the Senate Defense authorization legislation. The House spending bill also restores $100 million to the Defense Commissary Agency to provide reduced-price food and household goods for service members and their families. President Obama has proposed significant cuts to military commissaries, the heavily-subsidized stores on base where service members and their families buy food and other goods, which House lawmakers so far have rejected. The Defense spending bill is the fifth of 12 fiscal 2015 appropriations bills the House has passed so far; the Senate hasn’t passed any yet. The legislation funding the Defense Department is likely to be one of the few stand-alone appropriations bills Congress passes before the end of the fiscal year on Sept. 30.